The humus in the worm castings extract toxins and bacteria from the soil and can fight off plant diseases. Each worm casting has a sticky coating which prevents soil from becoming compacted or water logged. Worm castings restores nutrients back into the soil and plants grow stronger with deeper root systems. You never have to worry about worm castings "burning" your plants like other animal manure. Using worms speeds up the composting process. 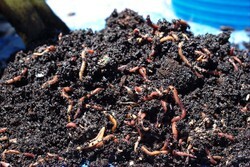 Compost piles without worms can take weeks to make humus. Castings contain more nutrients than good top soils. Organic kitchen waste can be kept out of the landfill if used in a worm bin. If you don't have much room, a small bin can fit on a balcony, garage, basement or other suitable place. You can also buy worm castings and worm tea (liquid fertilizer) from some garden shops or nurseries, or you can Organic Earthworm Castings online. Don't use chemicals in your garden - use Worm Manure! To Condition Your Soil: When you dig or hoe soil, mix in some worm castings and water the area. As a Fertilizer: Add worm castings to potting soil for your indoor plants and also mix it in the soil around plants, trees and bushes outdoors. Mix a cup of worm castings with a gallon of water and wait a week and use as a Liquid Fertilizer (Worm Tea). To Germinate Seeds: Mix worm castings with sand to make a germination mixture. You won't need to use plant food for at least three months. 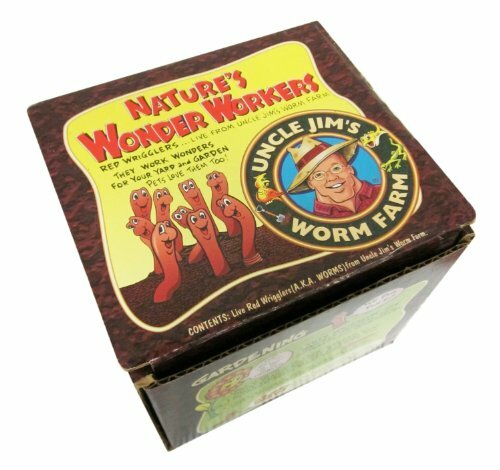 If you're not interesting in having your own worm bin, you can buy Organic Earthworm Castings instead of producing your own. Taking a Poll..... Do You Use Worms? Yes, to put in my garden soil. Coconut Coir is a 100-percent natural by-product of harvesting coconut. 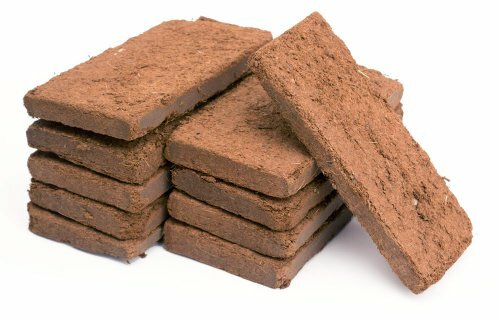 It's a sustainable alternative to peat moss - it does not produce the same environmental damage caused by peat mining and grows quickly for harvest. You can tear larger food scraps into smaller pieces so the worms can digest them easier, but don't bother grinding food up. Egg shells should be crushed, though. Don't feed your worms too much at once. Make sure they're eating what you've already put in before adding more. Meat and milk products in the worm bin are likely to putrefy and could attract mice and rats. Don't put in anything that is non-biodegradable. Sugary foods or grains create acidic conditions in the environment and the worms won't breed. Don't add kitty litter. The ammonia in the urine could kill the worms, plus cats can carry the toxoplasma gondii disease which can transfer to humans. Without a picture I could not say what type of worm they are. The word worm is used to cover very different creatures. For example, flat worms are not related to Earthworms, not even in the same phylum. There are also different species of Earthworm. When digging over a bed recently I was happy to spot some rich worm life. When I see a worm exposed to the light I try to cover it up quickly to make it comfortable by sprinkling some soil on top of it. Recently I saw some worms in the soil in my garden which certainly are not earthworms. I am always in dilemma while tending my small garden, whether the worms I encounter are pests or beneficial insects to the garden. However; I liked the tips for feeding earthworms. Though I do not grow them, I certainly would like them to thrive in my garden. An important point. There is a difference between compost worms and earth worms. Compost worms only dwell in decaying matter and therefore die in ordinary ground. Thus if you deposit a brandling [one compost worm] in your garden, unless you have a sufficiently large compost heap you are killing it. To enrich your garden soil use earthworms. I have thought of incorporating worms into my garden. Thanks for the way you've introduced the possibilities here. AngelaJohnson, Thank you! Worm-composting is popular for on-hands science in elementary schools and talks at farmers' markets. Part of its appeal also may be in how do-able it is in the home. happynutritionist - I remember seeing worms on the sidewalk after a rain when I was a kid. And when we'd go visit my grandparents and other relatives who lived in the country, I watched when someone would dig worms to go fishing. I live in an apartment and don't have my own garden, but whenever I do, I'll get some worms. I have never intentionally raised worms..once unintentionally did so when feeding a pet turtle in an aquarium as a child lead to tons of baby worms being in the gravel...but that is another story :-) I do however "rescue" them when I see them trying to get from one place to another and put them into my garden in hopes that they will settle in there. This is great information! Worm compost is so strong that you must apply it sparingly across the whole garden, so don't put it in one concentrated patch and expect to grow in it. Similarly the worm liquid needs to be mixed with water and spread across the whole area to be fertilized. Keeping the compost limed is important, as the worms dislike excess acidity, so a handful of lime keeps things sweet for them. I have always used organic compost for my garden. I definitely would love to try the worms. frankbeswick - I think it's great that when that farmer found a way to help improve his own farming methods, he turned it into a business.